Below find an overview of VoIP phone test requirements and solution. One of the major VoIP phone manufacturers wished to evaluate their VoIP Phones for speech quality performance before beginning mass production of phones. The manufacturer looked for testing methodology that proves satisfactory audio performance of VoIP Phones when operating as a handset, a headset or as a hands-free device (handset in speaker mode) against real-network conditions for bandwidth variations, CODECs, jitter, packet loss and more. End-to-End Testing where the VQuad™ with Dual UTA HD (or VQuad™ Probe HD) sits as the end point in the network, whether as PSTN phone or VoIP Phone, and simulates calls to DUT (IP Phones). This solution tests all possible call scenarios and network conditions. Identify and mitigate potential issues in the VoIP terminals that impacts voice quality or system performance. 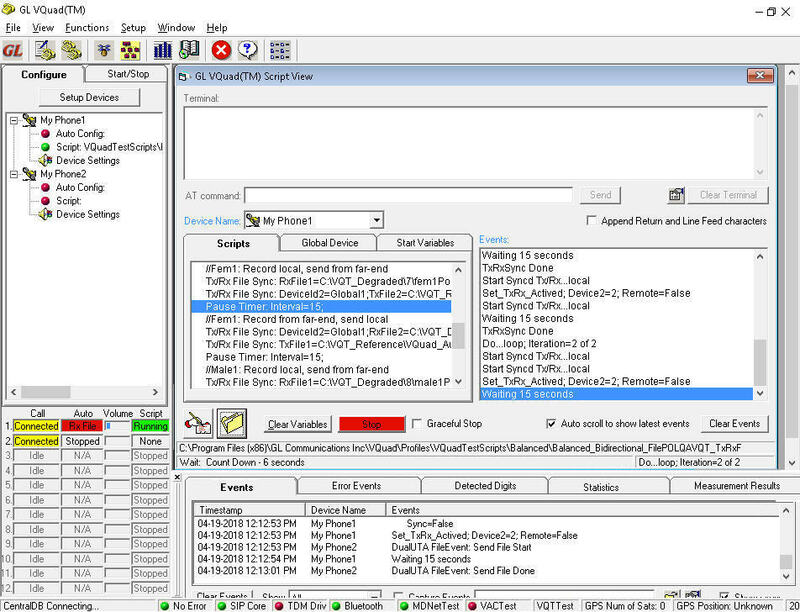 VQuad™ with Dual UTA HD, VQT POLQA, and WebViewer™ - Requires customer WinPC. GL’s VQuad™ Probe HDor the VQuad™- Dual UTA HD test equipment supports intrusive call quality assessment. It is a comprehensive hardware device designed to interface at end points and test the voice quality of telecommunication networks. The test equipment features all the circuitry necessary to universally adapt to any telephony instrumentation, including VoIP phones. The entire procedure of placing and receiving calls between end points is automated; quality is measured and reported centrally for verification. In all the scenarios depicted below, device 1 is connected to VQuad™ Probe HD port 1 and device 2 is connected to VQuad™ Probe HD port 2. The call is established between these devices. Once the devices are in connected state, you can send ITU-standard male and female voice files from IP Phone 1 and receive the files from the IP Phone 2 and vice versa. 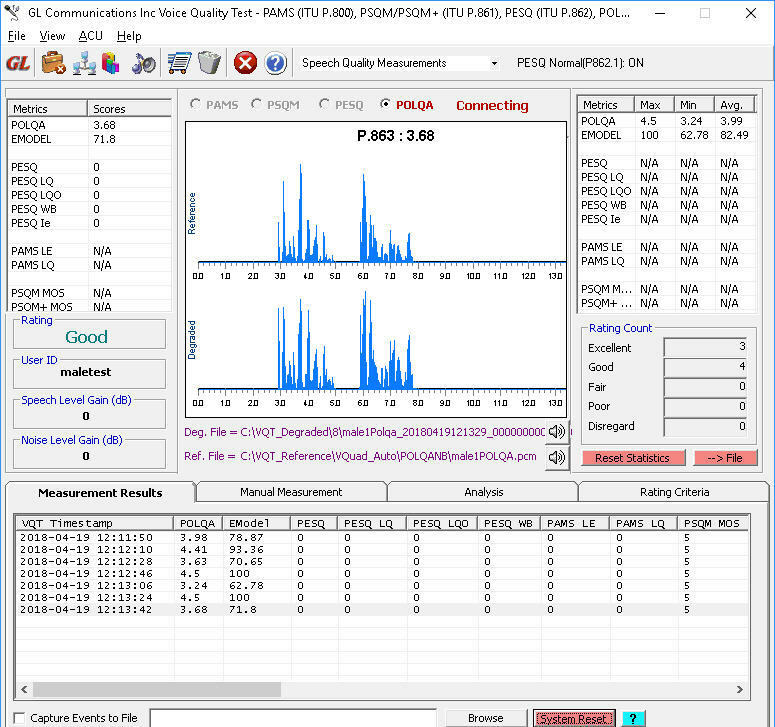 Both the Reference and Degraded voice files are submitted to GL's Voice Quality Testing (VQT) software for speech quality assessment per ITU POLQA (ITU-P.863) or ITU PESQ (ITU-P.862) standards. The tests report a variety of measurements including VQT POLQA MOS, E-Model, Active Speech Level (ASL), Mean Noise Level (MNL), RMS Mean Power, SNR, Jitter, Audio Dropout Analysis, and One Way and Round-Trip Delay measurements. Once a test is scripted as per customer requirements, it can be reused for repeated future tests. All results/events/errors are available on the WebViewer™ (Central Database) with outputs going to PDF, Excel or CSV formatted files for combining with their own results. The results can be filtered and queried using the WebViewer™ (web browser) with Custom Reports generated per user-specified requirements. The Custom Reports can also be generated automatically using the WebViewer™ Scheduler which supports results sent via email or SMS. Voice Tests per ITU-T algorithms (POLQA NB, WB, SWB and PESQ LQ/LQO/WB). Load testing possible with up to six Dual UTA HD units (12 devices) connected and running tests simultaneously. Time/Digit/Tone triggering of send/receive voice files. Additional measurements include Jitter, Latency, Noise and Signal Levels.